Prize winners in the United Way Pledge to Win raffle included (above, from left) Alex Piechocki (DuPont), Cameron Turner (Cargill), Desiree Roof (Cargill), Natalie Malkemes (Century Farm), Tim Mello (AES Armenia Mountain Wind), Elizabeth Page (Cargill), Stacey Bowman (GTP), Rick Morgan (GTP), Alisa Westbrook (Futures Community Support Services), Melissa Schwartz (PS Bank), Ronald Schnure (JELD-WEN), and Wayne Felter (Community Mail In). 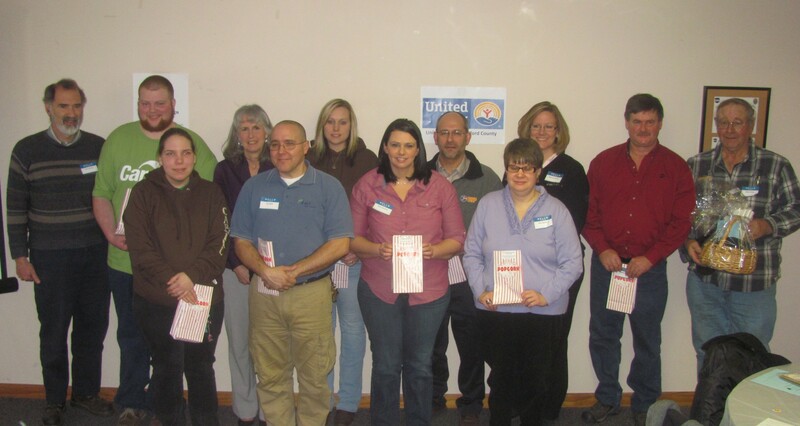 Employee donations account for as much as 65 percent of the United Way of Bradford County’s annual fundraising goal. 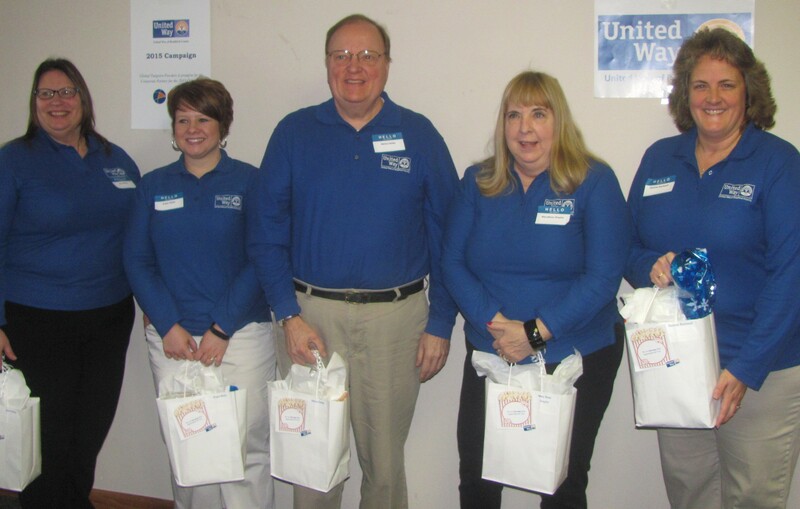 For a fourth year, United Way of Bradford County (UWBC) leaders held a breakfast banquet at the American Legion hall in Towanda to celebrate another successful year of meeting the needs of the community via the nonprofit sector and to thank numerous volunteers, team leaders, corporate sponsors and employees who commit a segment of their paychecks to the agency every week. 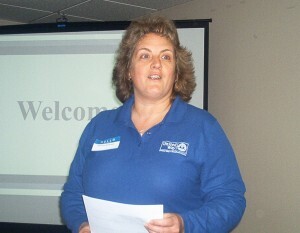 Campaign Chair Desiree Rockwell (above) emceed the Jan. 29 event, which included skits involving key partner agencies, recognition of the top contributing companies and those that made the biggest gains in the past year, and the distribution of valuable prizes to 20 randomly selected Pledge to Win employee participants. After announcing that UWBC had met its ambitious 2015 campaign goal of $475,000, Rockwell noted that 65 percent of that amount is a result of employee contributions. Honored as well were five couples who are members of the Tocqueville Society, each donating at least $10,000 per year. They were Ken and Caroline Taylor, Tom and Margarita Taylor, Randy and Nancy Williams, Max and Maureen Gannon, and Jay and Barb Chadwick. 2015 Corporate Partner GTP (Global Tungsten Products) was among the Top 20 Contributing Companies of the past year. Cargill Meat Solutions in Wyalusing Township was recognized for both its significant contribution as a corporation and for having the largest percentage of participating employee donors. Overall, Rockwell noted, Cargill provides 30 percent of the agency’s funding. Guthrie Health was cited for the greatest increase in employee participation. Giving and Fundraising Event Officer Jane Clements Smith was credited for boosting participation from 66 Guthrie employees in 2014 to 341 employees in 2015. GE Rail Car was thanked for dramatic increases in contributions, jumping from around $300 in 2012 to $17,000 in 2014. 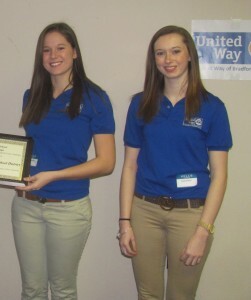 The Towanda School District was cited for the most successful School Campaign, and UWBC bid a bittersweet farewell to Towanda High School seniors Hannah Innocenzo and Kayla Grimes (above), who have served as the agency’s first youth board members for the past three years. The girls agreed that they gained valuable experience with UWBC that will help them in college and future employment. “We learned a lot more than we thought we would before we joined,” Kayla agreed, noting that they shared their knowledge of meeting structure with the THS Student Council. “It has made me a lot more interested in joining a board of directors,” Hannah remarked. Company representatives lined up to hand out the prize packages for the much-anticipated Pledge to Win raffle toward the end of the banquet. Prizes ranged from themed gift baskets, including several “date nights” in different parts of the county to an airplane ride and gift cards valued from $150 to $500. 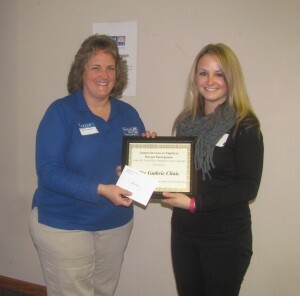 Alice Sergi of Guthrie Health, who was not present, won the top prize – a $500 Tops Market gift card. 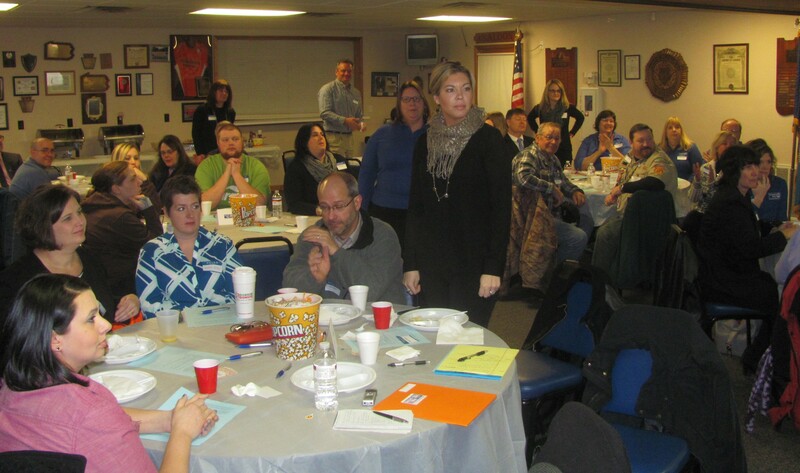 In addition to those pictured and mentioned above, raffle winners included Lorna Snyder (Wyalusing Area School District), Ken Wahlers (Arrow United), Natasha Lane (DuPont), Steven Nagar (Guthrie), Dennis Randall (GE Capital Rail Car), Scott Zaner (Gannon Associates), and Amy Allen (P&G). UWBC funding provides assistance to 70 projects coordinated by 45 agencies. To learn more about the agency, log on to www.unitedwaybradfordcounty.org. Rockewell noted that the agency does not yet have a corporate sponsor for the 2016 fundraising campaign, which will begin in nine months. Regional Volunteer Leaders recognized at the UWBC banquet on Jan. 29 included (above, from left) Wyalusing Regional Leader: Joan Kelley (Cargill, Assistant HR Manager), Towanda Regional Leader: Angie Wells (Human Resources Director of Futures), Valley Regional Leader: Henry Farley (Retired, Guthrie Clinic), Valley Regional Leader: MaryRose Shaylor (Retired, VA Clinic) and 2015 Bradford County Campaign Chair Desiree Rockwell (Memorial Hospital Nurse-Family Partnership Coordinator and Grants Administrator) Absent from photo of Regional Leaders are Shelby Napoli (Tuscarora Wayne Group) Wyalusing Regional Leader Stacee Bellows (State Farm Insurance, Troy) Western Bradford Regional Leader. Among the representatives of the Top 20 Contributing Companies recognized at the UWBC 2015 Campaign Celebration were (above, from left) Krystal Strickland (GTP), Angie Wells (Futures), Paul Chilson (JELD-WEN), Patty Dawsey (Memorial Hospital), Yesim Tuna (DuPont), Stacey Girven (Tuscarora Wayne Group), Alex Fried (P&G), Crystal White (Chesapeake Energy), Natalie Malkemes (Century Farm), Jane Smith (The Guthrie Clinic), Maria Wurzler (Cargill), Melissa Schwartz (PS Bank), Jody Place (Penelec), and Jeremy Gardner (Chemung Canal Trust Company). 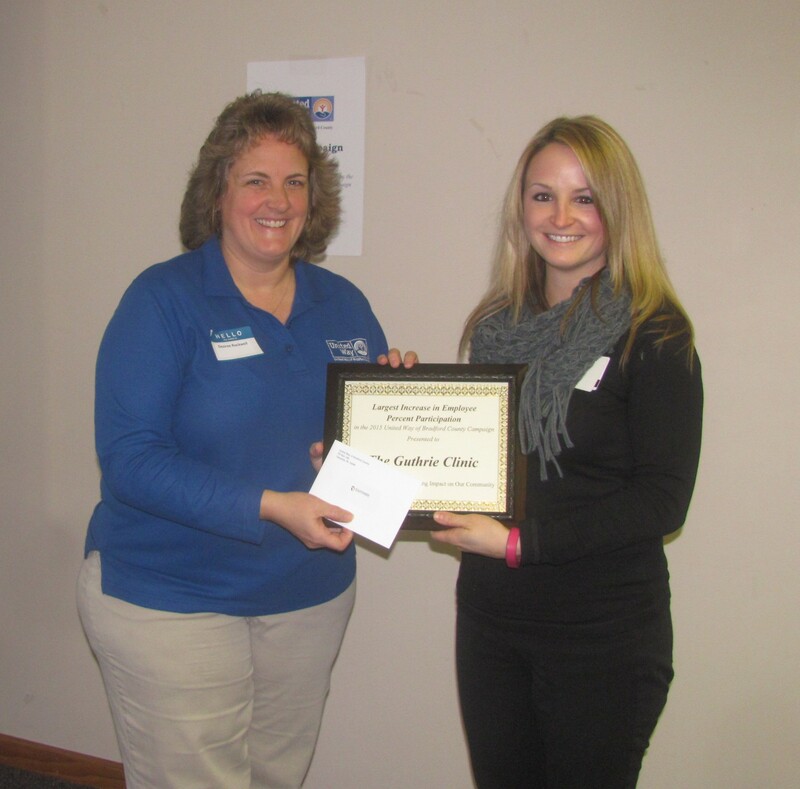 Bradford County Campaign Chair Desiree Rockwell (above, left) thanks Guthrie Health Giving and Fundraising Event Officer Jane Clements Smith for motivating 275 additional employees to become regular contributors to the agency through the Pledge to Win initiative.